The presentation’s goal: that in 10 minutes the listeners will have thought up some good ideas for getting other people to put your message and links on their site. Flattery will get you pretty far. If you can bestow authority upon another person, he or she may be willing to put “your” message, and link, on their site. Here’s an example of a WikiAnswers contributor. He proved himself an expert on our site, we offered him a badge acknowledging his expertise, and he agreed to put it on his site. This slide does double duty. First, when I was accepted to speak at SMX Advanced they offered me a badge, which linked back to them. 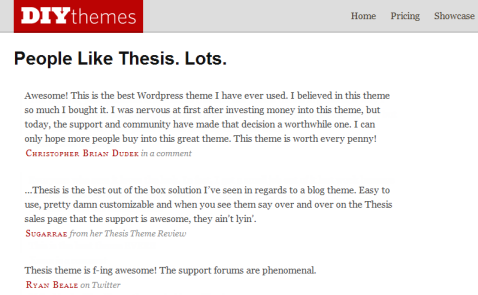 I put it on my site immediately because I was proud, and I thought it gave me more credibility. Also this post, Best of SMX Advanced, is an example of getting what you want by talking about how great other people are. I came last year and thought I’d blog the sessions, and then I saw that people like Lisa Barone, Barry Schwartz, and Virginia Nussey were already doing a better job than I could do. So instead I focused on the best moments of the conference. Now I also link to all the people I’m honoring, and I’m now offering them badges to put on their sites. We’ll see. When you do link to people, click on each link, to make sure they work, and to make sure you show up in their referrer logs. It’s a good way to build relationships. Last point in this section is to have some chutzpah. Who was I to start giving awards for SMX Advanced? Who cares? I did it, I made some people happy, I got some appreciation back, all was good. My favorite offline example of this is Stephen Colbert, whose book won the Stephen Colbert Award for Literary Excellence. You probably shouldn’t go that far, but you’d be amazed what you can get away with just by asserting authority. For example, I heard of a CEO who likes to prove his points by quoting his own blog. Works for him. This strategy of bestowing authority is great for generating some goodwill, building relationships, and getting a link — all good things — but you didn’t really get your message across. The next strategy is focused on getting your message out. 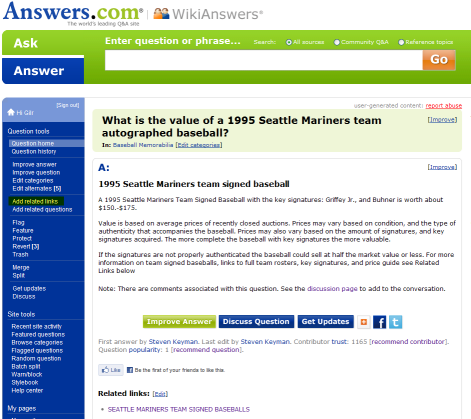 KeyMan Collectibles is a baseball memorabilia site that has made great use of WikiAnswers. The guy who runs the site has answered literally thousands of questions on WikiAnswers. Good answers, linking back to his own site. 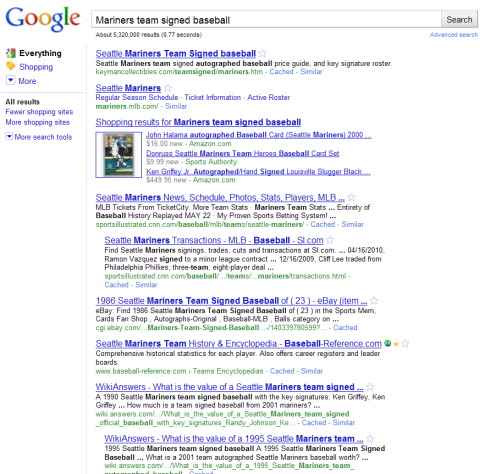 This guy’s site ranks #1 for Mariners team signed baseball, above the Shopping, above the Mariners, on a monetized, competitive search, and he pulls this off for many queries for many different teams and products. As far as I can tell he has no other external links to this page. Here’s a different example, a site called Best Buy Metals that went to Yahoo! Answers and answered questions like Where can I buy Corrugated metal siding panels? His answer is useful, and it links to his own site both as an answer to the question, and as the source of information. In this case his site didn’t rank in Google, but his self-serving answer on Yahoo! Answers did. He analyzed his efforts on Yahoo! Answers. 53 answers, 7 minutes per answer, $16 per hour to create the answers, and he found that his Cost per Conversion on Yahoo! Answers was about 30% less than his Cost per Conversion on his successful PPC campaigns. And that number should keep getting better, because unlike his PPC campaigns, the answers he already generated keep getting impressions and conversions without ongoing costs. On most of these sites the links are NoFollow, but even NoFollow links send you traffic. Some SEO experts say they help balance out your link profile and help you look legit. You can get Follow links on WikiAnswers, if you earn the community’s trust. 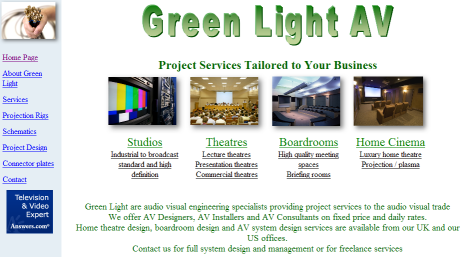 Feel free to reach out to me if you need more information on that. I haven’t found other Q&A sites where you can get Follow links. When writing on community sites it’s important to note that the rules have changed over the last few years. We had this era of anonymity, where you were encouraged to live your second life on the internet and choose some strange username that couldn’t get linked back to the real you. Then Wikipedia came around, and we had a nice increase in quality, but they’re ideologically opposed to any kind of self-interest. Most Q&A sites today are run according to social media norms, which encourage enlightened self-interest, and being yourself. As long as you serve the community, you can also serve yourself. I know this is true, because I read it on my blog. Find the community you want to be part of and get involved. First, join the conversation, through Twitter, blog comments, conferences, and any other way you can make contact. A few months ago a respected SEO named Rishi Lakhani wrote an article that I thought was one-sided. I respectfully commented on his blog, had some back & forth with him, and suggested that he supplement his post with some links arguing the other side, including a link to my site. He agreed. This started for me as a reputation management issue, but eventually also got me 2 good links and a good relationship. Get into the middle of a community’s common events. Go to conferences, blog about them, and use the events to build relationships. A community is also defined by its common enemies. I’m not proud of it, but I’m happiest and most creative when I’m at my most sarcastic. Without getting into ethical questions, if you need to blast somebody once in a while, make sure it’s somebody the community has marked as a common enemy. I wrote a somewhat negative piece about Jason Calacanis last year, and I was about to bury it as an unpublishable rant when I decided he’d earned it, and that this attack on somebody most of the community despises was more likely to help than hurt. A few months later I noticed a Twitter conversation where Aaron Wall and Jason were having it out, I @ replied Aaron with a link to my article, and next thing I knew I had one of my most valuable links in terms of direct traffic. At SMX Toronto, Dawn Wentzell mentioned that “Worst of” posts generally do better than “Best of” posts. I made good relationships and got some good links by replying to Derek’s attacks on the SEO community. I’d advise not to use this strategy too frequently. It can backfire, it makes you seem like a negative person, and it’s probably not where you want to go too often. Help people. My wife runs ThePetWiki. She added a widget to the charity of the woman who runs one of the key sites in the industry. It helped her get her link. It’s not the only reason she put the charity widget up, but it helped. I’m exaggerating the options, but IMO just because you’re not buying links doesn’t mean you should ignore the power of reciprocity. You just have to get into the softer world of indirect reciprocity and relationships. Goodwill gestures that you’re happy to do, and that may or may not get reciprocated. Also, this morning Matt Cutts advised “don’t chase the engines, chase the user experience. Because that’s where the engines are trying to go.” For link building I’d take that statement a step further, and say “chase the community.” The search engines want to know if the community likes and trusts you and your content. So focus on getting the community to like and trust you. Finally, make it easy to link to your site. 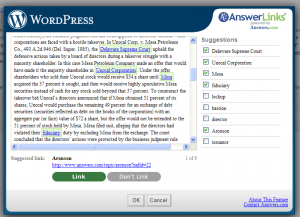 We made a WordPress plug-in called AnswerLinks that makes it easy for sites add reference links to their posts. If you missed anything, it’s all on my blog post, which was recently recognized as The Best Pre-Live Blogging of SMX Advanced 2010. I finally found a niche in conference blogging where I have an edge over Lisa, Susan and Virginia: pre-live blogging of my own sessions. 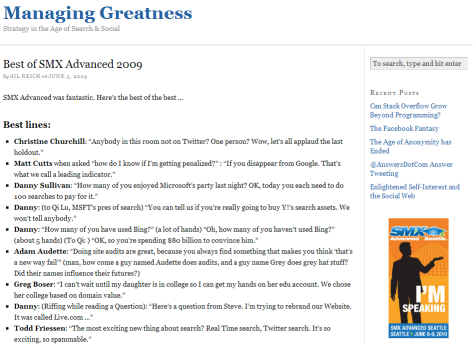 no.stupid.answers » Blog Archive » Gil Reich manages links, greatness, and even jokes.